Back together after directing distinctive halves (one silly, one serious) of My School Mate, The Barbarian, despite Wong Jing as writer/producer, the thriller affair Set Up settles on being one genre. In a way it's Wong Jing merging better with a filmmaker like Chung as the script leans slightly towards the exploitation side of both. Then again, it also leans towards the shameless imitator Wong Jing as I'm sure (but can't say for sure now) this frame story has been done in a known movie before (some hints of The Eye in reverse and Panic Room I guess?). Actually opening in a quite clever way as we see Moon highly immersed in her fictional world (her as the the prince of darkness exorcist but receiving a real life phone call within this illusion illustrates this), the switch to lighter emotions is the Wong Jing threat but we're probably more distracted by obvious script inclusions such as Moon receiving a harpoon as a wedding gift. Obvious prop destined for a call back but whatev, no one is reinventing the wheel script-wise here. Billy Chung also shows his love for over the top style with high usage of tilted angles and sped up imagery and for me, I wonder if Set Up will be one of those stylistic excursions equaling both lazy but that I'll fall for as I'm weak for loud imagery. 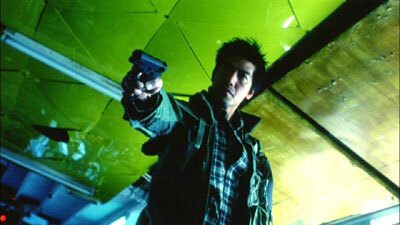 In fact, Chung creates a conflict in his direction via this usage. Part hyper, part simmering mystery, Chung wants his narrative to be a slow burner. He should've tied his shoelaces properly first as this choice makes him trip constantly. There is a fairly well created aura of mystery before Roy Cheung and company are introduced and one shouldn't let a low budget automatically mean a dismissal of a film. But the tense thrills and a FASTER pace to this largely one location movie is seriously lacking and even though Chung uses flashback exposition in an amusing way as he flashbacks just a few seconds after events (a device used much more poorly in his King Of Robbery), the basic need of Set Up never gets fulfilled. Unfortunately we know the filmmakers won't rebound with amping of tension as we roll along. In fact, as Christy Chung exhibits the feisty, fighting heroine the script calls for her to be, this aspect falls into the silly column as the once blind girl all of a sudden displays a creativity in setting traps. Basically being more resourceful than we ever expected and there isn't even ONE line by Wong Jing to set this up. Even I as a pretty bad viewer in terms of paying attention thought this lacked believability and therefore something surely must reek. Christy Chung wanders aimlessly but doesn't manage to embarrass herself and Roy Cheung puts forth leadership presence but at the end of the day, better filmmakers should make this film. Or they already did. Audio: Cantonese Dolby Digital 5.1, Cantonese Dolby Digital 2.0 and Mandarin Dolby Digital 2.0.